In a future where the boxing we know has vanished and been replaced with robotic boxers controlled by human beings, one down on his luck controller named Charlie Kenton finds himself taking care of his 11-year-old son who he's never met. Despite the distance between the father and son, the two soon discover common ground with a bot named Atom that just might have enough ability to get Charlie back into the limelight and give Max Kenton a real father. Back in 1987 a movie called "Over the Top" starring Sylvester Stallone released. It was about a long-haul truck driver who moonlights as an arm wrestler trying to restore a relationship with his estranged son. "Real Steel" is the 21st century update to that movie. Director Shawn Levy may not cop to my claims, but the film is nearly beat-for-beat the same movie. You can exchange arm wrestling with over-sized rock 'em sock 'em robots and boom you know what you are in for. With that said, what worked before works again. I found myself thoroughly entertained by the spectacle of "Real Steel" and pleasantly surprised with the genuine heart within. Much of the heart doesn't actually come from the relationship between the father and the son, instead it comes from the circuitry of the main robot named Atom. Let me clarify, Atom is the catalyst to the heart of the story. He is the friend Max Kenton needs while his father Charlie is not ready to cope with parenthood, he is the means to Charlie reliving his glory days and he is also the bridge that will restore a relationship between a father and his son. Atom is also possess his own heart. The cast aside shadow-boxing bot takes his beatings inside the ring but it is the emotional payoffs he delivers outside of the ring that showoff his true heart. I credit director Shawn Levy for having the know how to lay down some subtle and emotionally rewarding sequences with a robotic form. Stan Winston's creature shop Legacy, deserves a heap of credit for creating Atom and the rest of the robotic boxers. All of the robots conveyed authentic character that really rang through on screen. The creators behind "Real Steel" were wise to take a chance and build physical bots to use with the actors. There is one scene in particular with Max and Atom where Atom picks up Max and shadows his movements. This scene slams home how important it can be for actors to work with a physical being rather than imagining, not to mention being one of the better emotional moments in the story. Don't get me wrong, cgi is awesome and this film relies heavily on computer graphics, but the presence of these bots in the movie really added another level of enthusiasm and authenticity. "Real Steel" is stuffed with thrills. Every single one of the boxing matches are a ton of fun to watch. The scenes have a nice blend of sensation and comedic relief. Like the movie explains about the sport, it is a spectacle to watch these robots battle. Being machines it is easy to not suffer as they are bashed and mashed either. I remember always being gut wrenched watching as Rocky or Daniel Larusso were beaten within an inch of their life. The audience will still feel the impact of the destruction on screen, but unlike if these were real humans it is easier to keep yourself unattached to the brutal beatings on display. 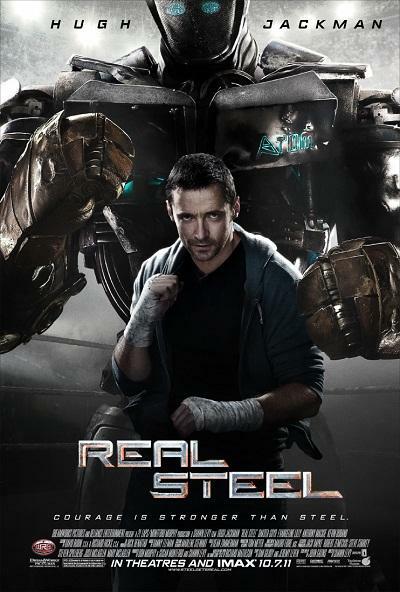 Outside of robotic boxing, there isn't anything new in "Real Steel." The film goes through the same tropes and beats you would expect any sports or relationship movie to. The audience follows a typical underdog story spliced together with an alienated son trying to win the affection of his self-absorbed father. Director Shawn Levy deserves notoriety for showing the ability to deliver an even keeled relationship/sports movie that never played its hand to heavily. There are sappy moments that will make certain audiences members cringe but they never become overbearing or to the point where it pulls the viewer completely out of the story. Overall the thrills and action within the robot boxing ring outweighed any negative emotional beats I found in the predictable plot.